Is Google+ the best marketeer? It certainly can feel like it is your businesses best friend if you get it well optimised, it can increase visibility, give driving directions and help customers contact you ultimately increasing more sales. I recently optimised a clients Google+ page to make it visible on local business. This increased the visibility of the business in search queries and helped customers find the business via a number of tools increasing the customers user experience. With Google insights any changes made to your visibility and customer interaction on the Google platforms can be measured. You can see much more detail by clicking on the ‘view insights’. The date range can be changed as required from 7 days, 30 days, 90 days or all time. This shows the number of impressions returned on the Google searches, Maps and mobile. Driving directions – This is the number of clicks in Google Searches and Google maps for driving directions to your business, in the above infographic you can see 259 people have clicked for directions to the business. Clicks on Website – This is actual clicks on to the website from Google platforms of Searches and Maps (excludes things like direct clicks, searches on Bing, Yahoo etc. ), 1360 direct clicks from Google are shown in the infographics. Phone calls – This is the number of clicks on the phone number from Google Searches, Maps and Mobile – you can see that 83 phone calls were made from Google search. These can also be shown by the day of the week etc within the insights. When you type the name of a business into search engines (without the .co.uk or .com) it returns a snippet of information on the right hand side of the page about your business this is fed from Google+. 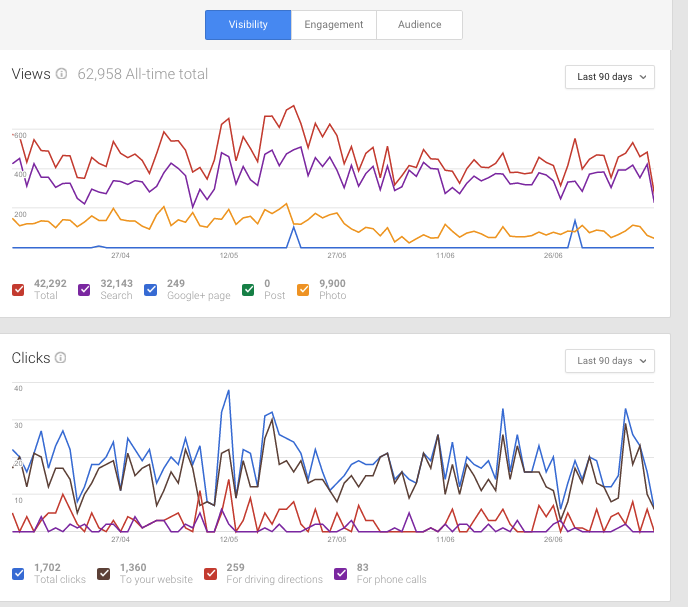 More information on Google insights. This entry was posted in SEO on July 12, 2015 by Mick Kenyon.